I've had a full, rich spring break staycation with my family. I've enjoyed waking up early, reading poetry, writing and revising poems, cooking, walking the dog, catching up on adulting details (doctor visits and cleaning) while spring unfolds all around with Virginia Red Bud and Cherry blossoms. It's been so nice, I hate to see it come to an end. For those that celebrate, chag Pesach samech and Happy Easter this weekend. on Brain Pickings by Maria Popova. 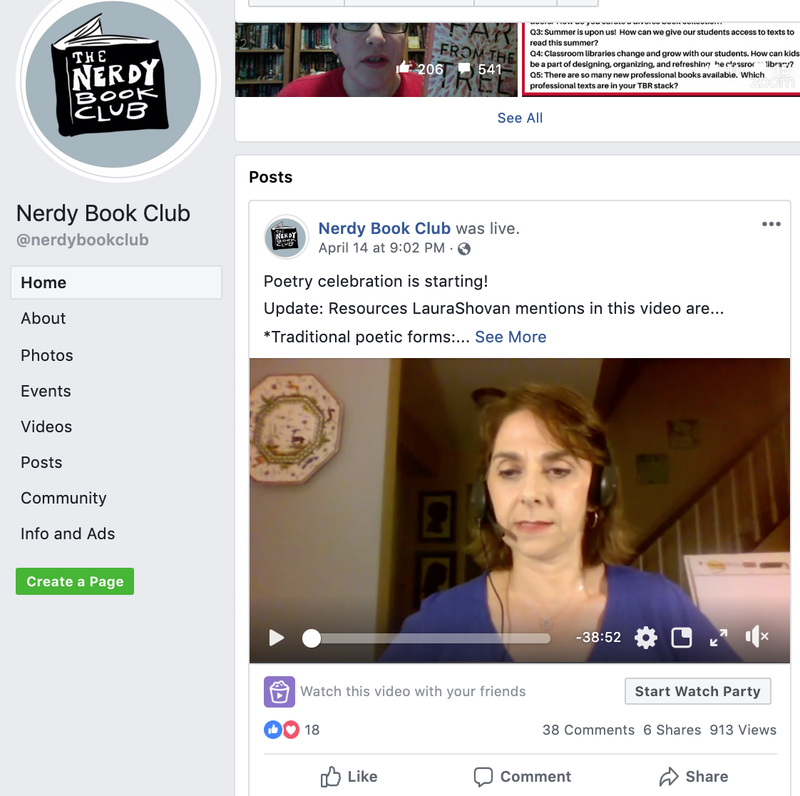 ...which reminded me of The Nerdy Book Club's Celebration of Poetry last Sunday with Laura Shovan. She gave a delightful presentation of teaching poetry to young people--loaded with resources. Make sure you check it out on facebook. One moment, and a story. And inside the crook of my arm. I hope you are enjoying #NationalPoetryMonth as much as I am. Our Kidlitosphere Progressive Poem is shaping up nicely with selected song lyric lines. My line was from Stevie Wonder's 'Isn't She Beautiful', less than one minute old added yesterday. What would you add next? Finally, as I write this, we are celebrating National Poem in Your Pocket Day! It is a treat and a blessing to have received a postcard poem from Irene Latham to carry in my pocket...which was actually my book that I'm reading and sat down with in the late afternoon. Thank you, Irene! What poems do you carry? Praise stones and blossoms equally. Electrify your life with questions. Most of all: give thanks. I just caught a poem from one of my favorite poets, Amy Ludwig Vanderwater. She had the 17th line in this year's Kidlitosphere's Progressive Poem and told me to "take it away," because I have line 18 today. Our progressive poem, contains lines contributed by a different authors. This month, kidlit poets from around the blogosphere each contribute a line from a song to the poem as it grows and grows. 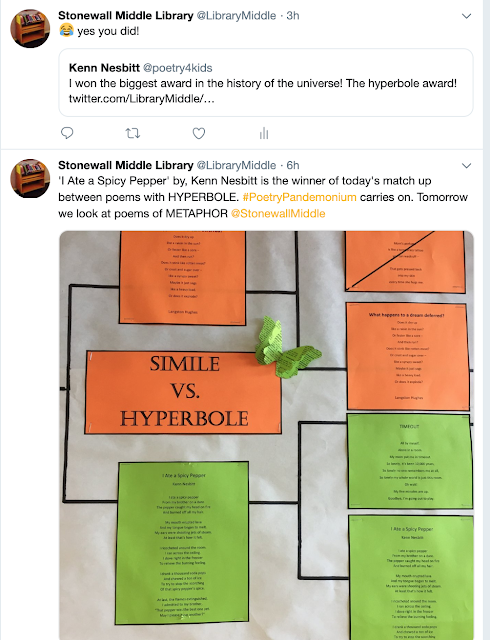 Kidlitosphere bloggers have been doing this since Irene Latham started our annual #NationalPoetryMonth tradition in 2012. This year, poet author Matt Forest Esenwine challenged us to use lines from song lyrics. I have a handful of songs that immediately put me into a good mood. Isn't She Lovely by Stevie Wonder is one of them...my line is from that song. L12 Lin-Manuel Miranda, "Underneath the Lovely London Sky"
SPRING BREAK starts today. Wheeeeeeeee! Thank you to Irene Latham for hosting this week's round-up at her blog, Live Your Poem AND the amazing Progressive Poem this year. My day is coming up and I've tuned into my Classic Rock station to be ready for my line on 4/14. #NationalPoetryMonth stresses me out a tiny bit. I'm excited as a reader and writer of poetry. I'm also a Poetry advocate and want spend my time getting poetry out to everyone. I find it hard to both as well as and as much as I would like. This month I've been sharing Poetry Pandemonium progress...but none of my own writing. I've been playing with meta-poetry. Meta poems are poems in which the poem is about poetry. in a dream of hide and seek. when a poem is fast asleep. I will post the winner on social media as soon as we know and here after school. Enjoy some pics below of my school's Student Literacy Council hanging poems up in the wilds of our hallways, windows, bathrooms for #NationalPoetryMonth in conjunction with Poetry Pandemonium. These were the "extra" poems not selected for Pandemonium brackets...but cheerfully used in this way. then went out to hang it up. Happy Friday and Happy Poetry Month to All! I hope you are enjoying some reading, writing and listening already this April. There are so many wonderful kidlit poetry celebrations. For a full list, see Jama Rattigan's post of 3/29. For this week's Poetry Friday round-up visit Karen Edmisten. Thanks to her, we have a lovely collection of blog entries to peruse this weekend full of Poetry Month postings. Thank you, Karen! Last week, I detailed the implementation of Poetry Pandemonium at my school. This project is a review of Language Arts concepts embedded in a brackets style poetry competition before state testing begins at the end of April. For these details, click here. So far, Poetry Pandemonium is going swimmingly. 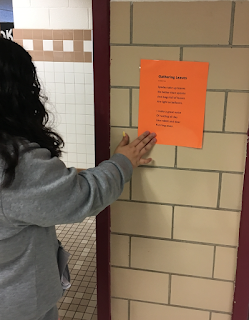 Teachers have commented on how much they have enjoyed sharing poetry in homeroom with their students. However, an anonymous survey at the end of the project may produce some tweaking that needs to be done. This is the first year my school's Literacy Council has hosted the project. This week I'm sharing poems from the project. If you have resources you'd like to share back--that would be super! I love great collaborations among friends. The Poetry Friday Anthology for Celebrations: Holiday Poems for the Whole Year in English and Spanish, by Janet Wong and Sylvia Vardell (Pomelo, 2015). These are resources that I introduced to and reminded colleagues of. Both are available to staff in our professional collection. 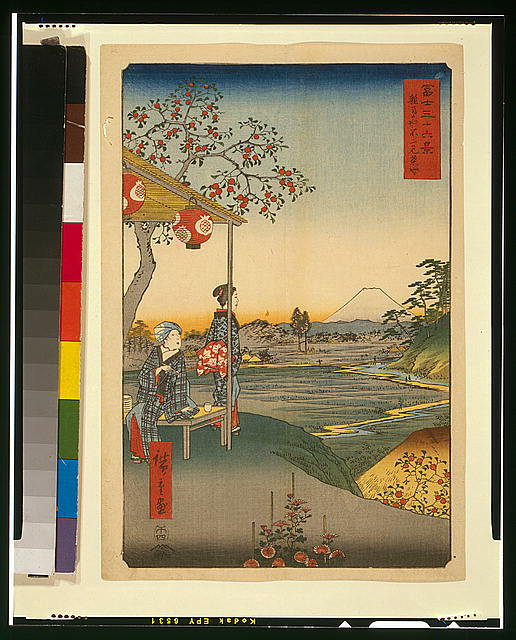 Teachers contributed poems from their various sources. And, I think the strength of Poetry Pandemonium is that it was created from contributions from staff members. 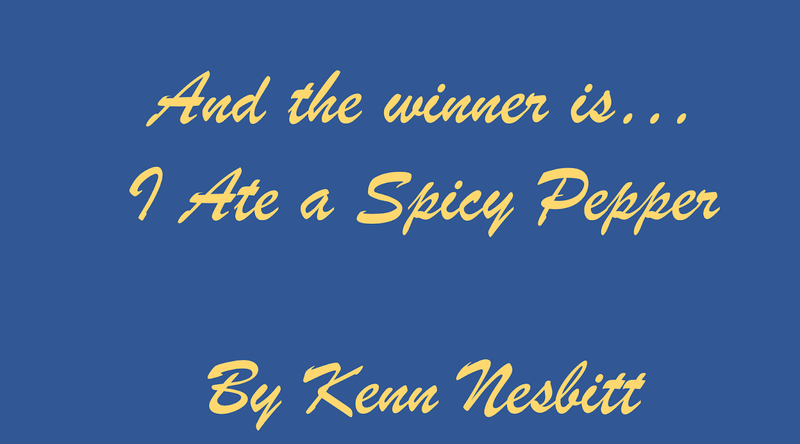 Getting a response from @poetry4kids (Kenn Nesbitt) over his poem winning the Hyperbole contest was extra fun this week! Good Friday, Dear Poets. Carol's Corner is hosting our round-up of links to more Poetry Friday goodness and kicking off the festivities with Ralph Fletcher's Daffodils. Lovely! Today I'm wearing my Teacher-Librarian hat....my poet hat is at the dry cleaners. Every April, I scramble a bit to be an active participant in Poetry Month festivities...AND share with students. This year, with the help of the Literacy Council in my school, I'm a bit more into the poetry-swing-of-things personally and professionally. 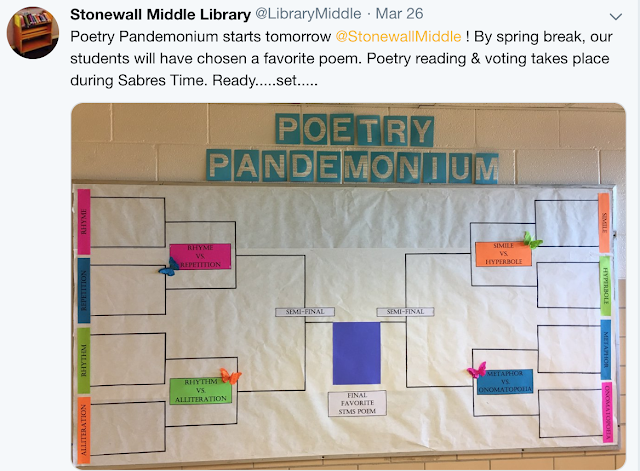 I asked my school Literacy Council if they would host Poetry Pandemonium*, a brackets style competition just before spring break. The poems would include examples of language arts content tested in end-of-year state exams. Literacy Council was game....my co-librarian and library assistant are fantastically creative. They helped lead this project. Hope and Mary make the "me," "we" in the following description. Step 1: Gather poems. 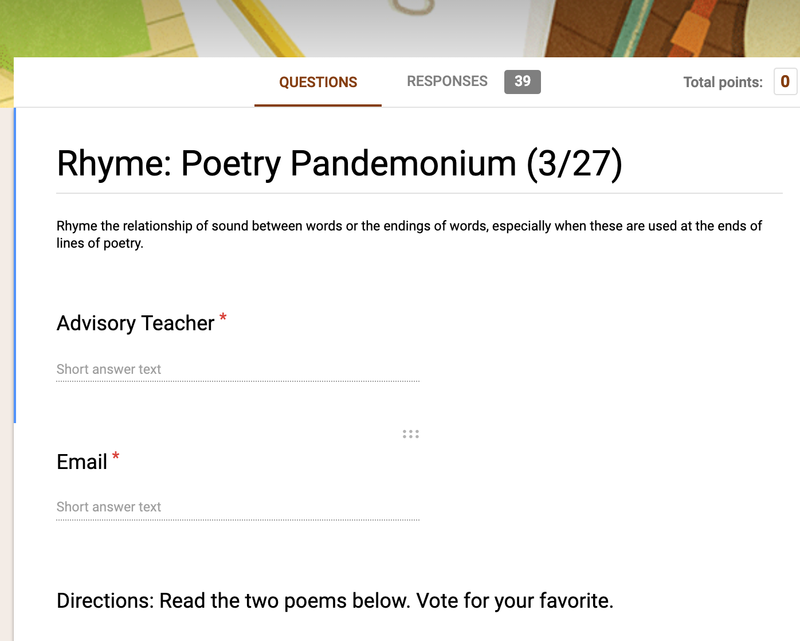 We asked Literacy Council teachers to submit poems that could be read aloud to students during homeroom. 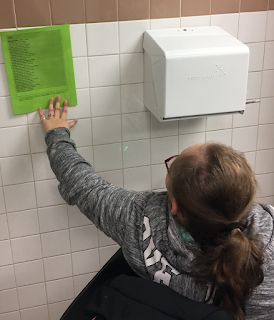 Each poem submitted was to be hi-lighted with figurative language or literary device concepts from our state standards. Step 2: Choose two poems from each category. We narrowed down the poems by strength of the example of figurative language/literary device and length. Homeroom is short. We needed short poems that a class could vote their favorite within 15 minutes. Step 3: Brackets. I had to ask for extra help with this. 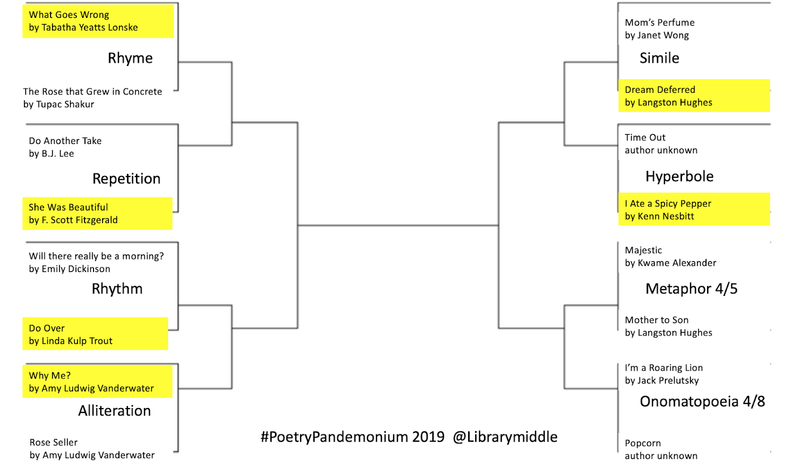 One of our Literacy Council teachers had no problem setting them up so that our Poetry Pandemonium would be complete by spring break, April 12th. Step 4: Our library assistant took charge of the display with her flair for perfection, style, weeded book pages and fun paper butterflies that she made. Step 5: Prepping staff. Asking staff to add one more item to their early morning to-do list can be dicey. We sent out the following. 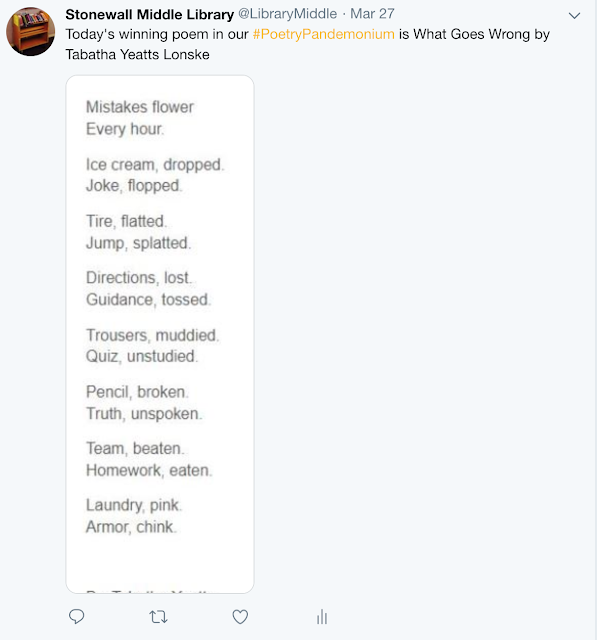 A "head's up" e-mail on Monday alerting staff that Poetry Pandemonium started on Wednesday. Placed a paper copy of the brackets and directions in each homeroom teacher's mailbox. 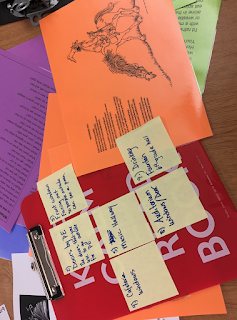 Timed our first Poetry Pandemonium to go out via automatic delivery at 8 am each morning. so that by 8:15 when students arrive, it can be up on screens in classrooms. Provided very simple paper instructions with paper copy of the poems to our substitute coordinator. She made sure each substitute had the poems for homeroom. 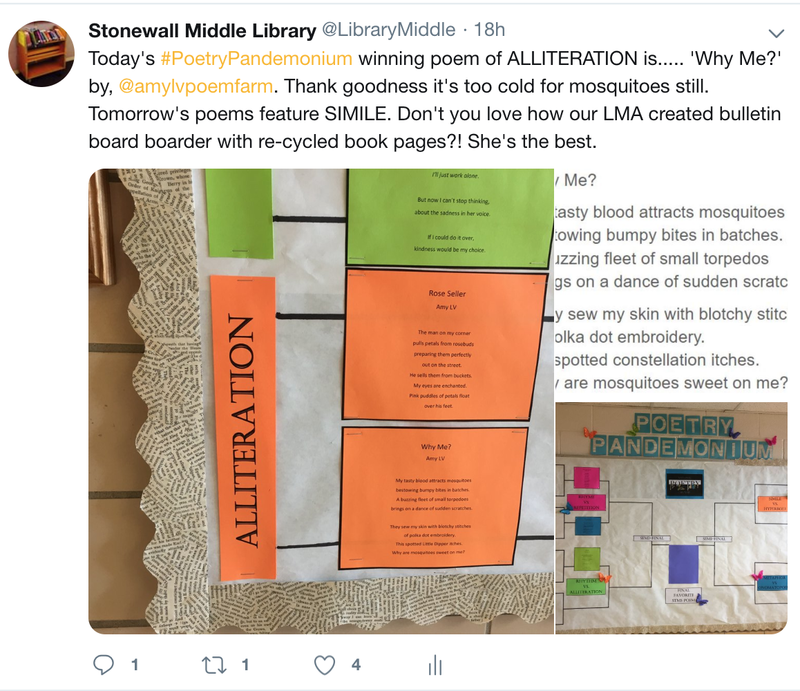 Wrote an announcement for the principal to read over the PA at 8:15 alerting teachers to open up their e-mail for the Poetry Pandemonium link of the day. Step 6 Delivery. We used google forms to share the date, featured figurative language and poem. Since formatting a poem is near impossible to do in google forms, I typed out each poem (that were carefully edited by my helpers) and took screen shots of them. 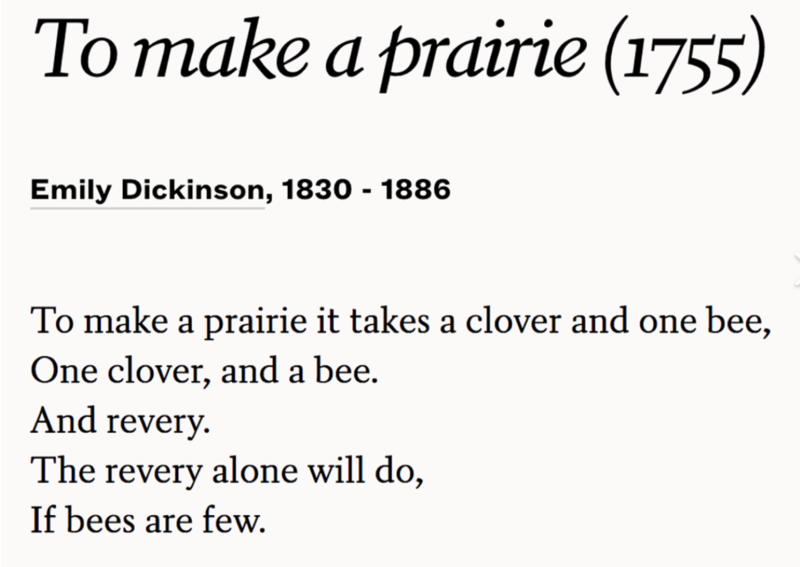 I saved the poems as jpgs and then uploaded them as photos into google forms as a quiz question. Each "question" in the quiz was a photo of the poem. There were a total of 3 questions. The third question was multiple choice of only two options the title/author of each poem. 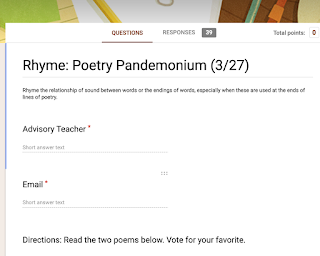 The poem that got the most votes is the choice the teacher clicked before submitting the survey. Step 7 Announcing winners! 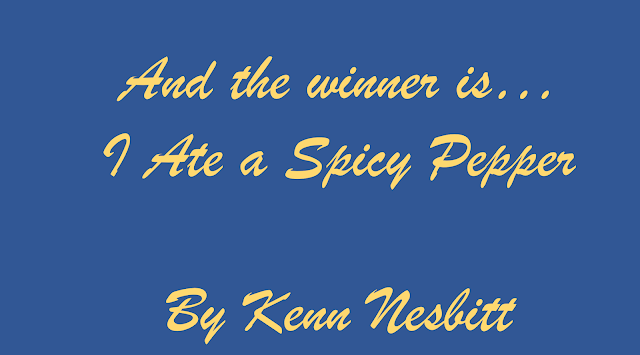 At the end of each school day, the winning poem is announced in afternoon announcements by our principal. 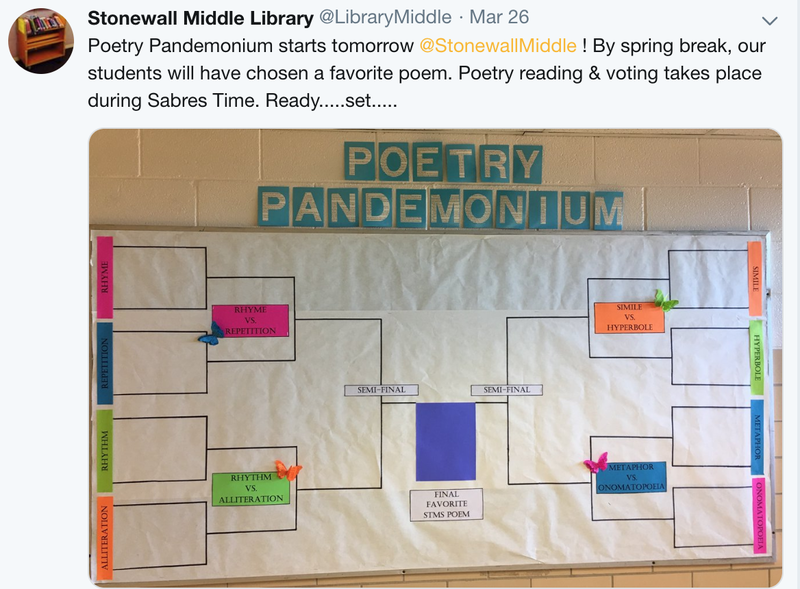 The winning poem is then displayed on our bracket bulletin board and shared on social media. Step 8 What to do with all the poems NOT selected for Poetry Pandemonium? We have printed them on bright paper that matches our bulletin board and next Friday, students from our Student Literacy Council will put them up all over the school for National Poetry Month. No poetry will go wasted! 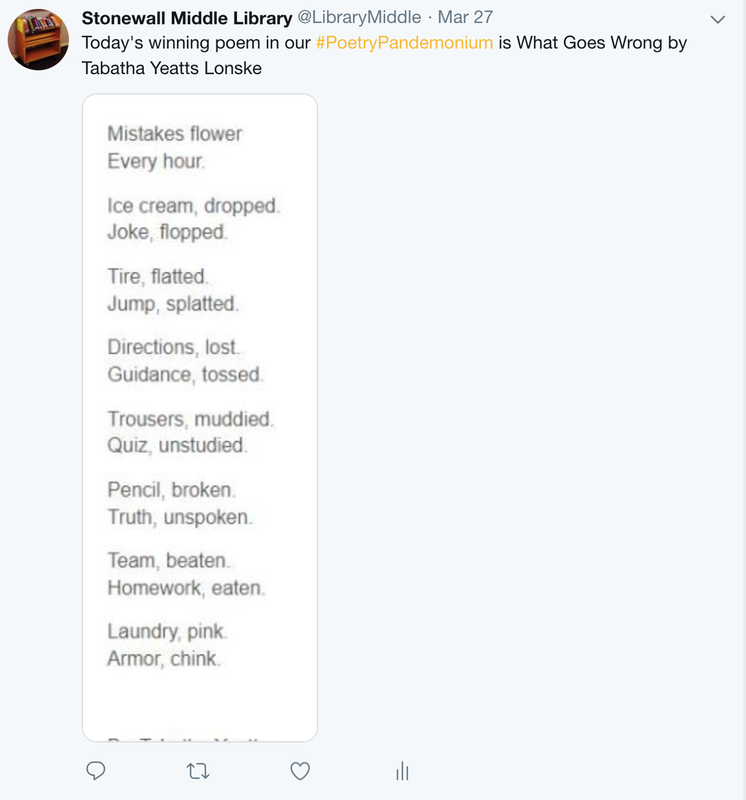 Next week, I'll share how Poetry Pandemonium is going. Wish us luck! Welcome, dear Poetry Friday. I've been busy this week with work and family and writing. I look forward to the reading treasures I'll find in you. Thank you, Sloth Reads for hosting today's round-up. I see you've been busy too! Snyder,Gary.“Kyoto: March by Gary Snyder.” Poetry Foundation, Poetry Foundation, www.poetryfoundation.org/poems/50613/kyoto-march.